SYLVIE THE SECOND is a daring new YA novel from Wellington publishers Makaro Press (Submarine imprint). 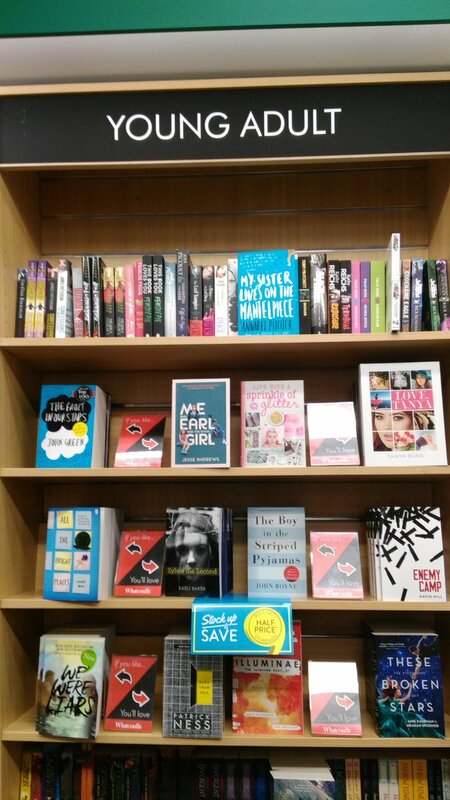 Like Sylvie, it’s finding its way to being more visible and has even been spotted on the shelves at Whitcoulls next to teen favourites Johns Green and Boyne! The book deals with some difficult but important issues that also need to be made much more visible in our society. I hope it will start some good discussions with young people and their families about what they experience and how they cope with the pressures and expectations of growing up. SK: This novel tackles tough but very real teenage issues. What kind of reader did you have in mind for this book? KB: I guess I was aiming for teens, particularly girls, who are struggling a little with finding their way, their voice, their values… So, basically teenage girls in general! Being a teenager is hard enough and then when you add extra stress to the mix (and everybody has extra stress in one way or another), it can become even more difficult. SK: But there are some positive moments in this book too and the ending was particularly heartening. What do you hope readers will take away from it? KB: Most of all I hope that readers will put the book down after the last chapter with a renewed sense of hope and faith in friendships, a clearer sense of how they are willing to be treated by their peers and where their limits are, and a little more confidence in seeking support if they need it. SK: There must have been some difficulties in writing this – trying to give a sense of hope and ‘normalcy’ to Sylvie’s life, but not underplaying the very damaging and traumatic events she is experiencing. How did you handle this balance? KB: I think Belle and Adam were significant for keeping the balance of normalcy and hope in Sylvie’s life. I felt like it was important to confront Sylvie’s hardships and trauma, but also give a nod to her resilience. Even when things are going wrong she gets up every day and has a goal in mind – to get through it. It’s just that some of the ways she learns to cope aren’t healthy. I think that if she didn’t have such a loyal friend in Belle, especially, things could’ve been much worse. The brief interactions with strangers was another way in which I tried to weave some hopefulness into the equation. The woman on the bus, the little girl and the guy on Christmas day… Even Alannah, the doctor. Often we influence other people without even realising it. Our interactions can be so valuable and we give away pieces of wisdom all the time without realising that anyone’s heard it. I wanted to convey that, and also provide some faith in humanity – there are a lot of nasty people in Sylvie’s life, for whatever reasons, and I felt like it was important to remind the reader that most people are good, and not out to hurt them. As a teenager, as a woman, and in fact just as a human being, it can be hard to trust that sometimes. SK: What other difficulties did you come across? KB: The self-harm was something I thought a lot about. I didn’t want to glamourise it, or offer it as an effective strategy for Sylvie to cope with her distress, but I did want to address it head on since it’s a real method that some people use. I guess I wanted to write about it fearlessly but sensitively at the same time. Sylvie’s regret is clear throughout – she knows it’s not a solution for her. In saying that, I was cautious not to come off as preachy. I found it one of the most difficult things to balance. SK: Belle is a lovely character and, as you say, a strong support for Sylvie. Is there a “Belle” out there for all of us when times are tough? KB: I definitely think there is, in some form or other. She might be found in the shape of a friend, a family member, a counsellor, a voice at the end of a helpline or someone’s personal faith. It’s really important to remember that even when we feel like we have no one, there are still people who will help us, and things to hold on to. SK: One thing that worried me about Sylvie was how easily she was able to get close to someone after what happened at Chris’ party. I wondered if this was her dealing with or failing to deal with things? KB: Such a good question! It’s absolutely a sensitive situation, and everyone who has been through an experience similar to Sylvie’s will process it in different ways. So I think the answer to this question is really up to the reader’s interpretation. Adam is an important person in Sylvie’s story in that he represents the good guy. It’s so easy to believe after you’ve been hurt that everyone is bad, and I wanted to put forward the idea that that’s not the case. Whether Sylvie letting him get close to her is a mark of dealing or not dealing is up for debate. SK: What do you think the main differences are for this generation of teenagers compared to previous generations? Do these worry you or give you hope? KB: I think one of the biggest differences is social media, which is a bit of a double-edged sword. On the one hand it’s great at keeping people connected and it’s such a good platform for change. On the other hand it can be difficult not to compare yourself to other people’s seemingly perfect lives, and there are more social pressures, covert but constant bullying, sexting … I think it can lull people into thinking they’re in control, but social media platforms like Facebook and Snapchat keep all of your photos – and so can the person you sent them to. It really worries me. Having said that, I celebrate the fact that society is now better at having difficult conversations around mental health, domestic violence, sexual assault, and other topics that are real and relevant but have historically been brushed under the carpet. There are so many amazing organisations working to help people experiencing these problems and encouraging society to keep the conversations going. Young people’s voices are being heard more now. That gives me a lot of hope. SK: Your current work with teenagers has no doubt informed the themes of this novel, but have you always been a writer too? KB: I didn’t set out to be a writer, but it’s always been something I enjoyed and did a lot of. I wasn’t great at a lot of subjects at school, but right from my primary school days I have memories of teachers raving about the stories I wrote. I also have journals full of poems that I’ve written throughout the years. 85% of them are absolutely terrible! It’s quite funny and also extremely cringe-worthy reading them now. SK: And how did this novel come into being? KB: The idea came to me one day and I immediately sat down and began writing furiously. It was like Sylvie had been waiting to tell her story for ages. It took me about a year to write the whole thing, usually after work in the middle of the night with many cups of tea. Once I learned it had been accepted for publication the editing process was pretty full on. There were huge chunks taken out that were slowing the whole thing down and more dialogue added. It took a long time. A lot of it was actually edited while I was overseas. I remember sitting in an airport in Birmingham editing it as a bunch of extremely heavily armed police traipsed past. That was an unnerving moment… I also did a lot of the editing in Wales, in this little stone cottage near Hay on Wye. It was quite a well travelled manuscript! SK: Are you working on other writing projects you can tell us about at the moment? KB: I’ve just finished up a collection of short stories and have started writing something new – a bit of historical fiction. I also have another story that I’m always adding to when the inspiration hits. I’m really never not writing. Except when I’m sleeping. And eating. SK: What are your hopes for Sylvie – the book and the character – now? KB: I hope that the book reaches someone who needs it. That’s all I can really ask for. For Sylvie herself, I hope that she continues navigating bridges and finding her way. And I hope that she and Belle are old ladies sitting together on the front porch one day. With lots of cats. And leave a comment for your chance to receive a bookmark and copy of Sylvie the Second. Love the cover and title! I’m actually half way through reading Sylvie the Second now and really enjoying it. I think it captures a range of modern teenage dilemmas perfectly.